This lesson focuses on artworks pertaining to the theme of labor and art from around 1850 to 1900, many of which are part of the core canon of nineteenth-century art history. Primarily focusing on works produced in France, it does address some works from other countries (like Britain, Germany, and the United States), and could be made much more international at the instructor’s discretion. As the topic of “labor” in the nineteenth century can be thought of quite broadly, this lesson has been divided into three thematic sections. Not all forms of labor are the same; nor were they viewed in the same way in the nineteenth century—either by artists or the general public. As such, each of the below thematic sections will address issues distinctive to that topic, such as relevant socio-political contexts and/or why artists may have been drawn to a particular subject. Although our understanding of labor shifted drastically in the nineteenth century, it does not mean that this period marks the first time that artists depict workers. (In particular, agricultural laborer has appeared in the visual arts since at least the Middle Ages.) Either before or during the lecture, consider works that you may have previously discussed in class (such as Pieter Breugel the Elder’s The Harvesters (1565). How has work been depicted previously? What about peasants? Have there been any discussions of urban workers? Why/why not? Another way to start your class discussion of labor is by first brainstorming what types of occupations or labor you expect to see depicted in art. Then, after the lesson, you could revisit the class’ list and compare it to the lecture. Were there any surprises? Are there occupations that you were expected to see but did not? Or, conversely, were there occupations that artists depicted that you did not expect to see? Why do you think that might be? Gustave Caillebotte, Floor Scrapers, 1875. Eisenman, Stephen J. “The Rhetoric of Realism: Courbet and the Origins of the Avant-Garde.” In Nineteenth-Century Art: A Critical History, 242-264. New York: Thames & Hudson, 1994. Nochlin, Linda. “‘Il faut être de son temps’: Realism and the Demand for Contemporaneity.” In Realism, 103-177. New York: Penguin Books, 1971. ________. “The Image of the Working Woman.” In Representing Women. New York: Thames and Hudson, 1998. Weisberg, Gabriel P. The Realist Tradition: French Painting and Drawing, 1830-1900. Cleveland: The Cleveland Museum of Art in Cooperation with Indiana University Press, 1980. Barringer, Tim. Men at Work: Art and Labour in Victorian Britain. New Haven: Yale University Press, 2005. Clayson, S. Hollis. “The Family and the Father: The Grande Jatte and Its Absences.” In Readings in Nineteenth-Century Art, 212-229. Upper Saddle River, NJ: Prentice Hall, 1996. ________. Painted Love: Prostitution in French Art of the Impressionist Era. New Haven: Yale University Press, 1991. Iskin, Ruth E. Modern Women and Parisian Consumer Culture in Impressionist Painting New York: Cambridge University Press, 2007. Lipton, Eunice. Looking into Degas: Uneasy Images of Women and Modern Life. Berkeley/Los Angeles: University of California Press, 1986. Nochlin, Linda. “Morisot’s Wet Nurse: The Construction of Work and Leisure in Impressionist Painting.” In Women, Art, and Power: And Other Essays, 37-56. New York: Harper & Row, 1988. Barringer, Tim. “Aestheticism and Labour.” In Men at Work: Art and Labour in Victorian Britain, 315-21. New Haven: Yale University Press, 2005. Blakesley, Rosalind P. The Arts and Crafts Movement. New York: Phaidon Press, Inc., 2006. Eisenman, Stephen J. “Architecture and Design in the Age of Industry.” In Nineteenth-Century Art: A Critical History, 310-331. New York: Thames & Hudson, 1994. Merrill, Linda. A Pot of Paint: Aesthetics on Trial in “Whistler v. Ruskin.” Washington, D.C.: Smithsonian Institution Press, 1992. Bourgeoisie: the middle and upper-middle classes. Within the context of Marxism and capitalism, the bourgeoisie is associated with the social class that controls the means of production and the majority of wealth. With the rise of the middle classes in the nineteenth century, the bourgeoisie became the arbiters of cultural taste and art production. The term ‘bourgeoisie’ is most commonly used in relation to the emerging middle and upper-middle classes specifically in France. Proletariat: the workers or working-class population. In the context of Marxism and capitalism, the proletariat is typically associated with industrial wage-earners whose only real asset is their time and ability to work. A combination of rural food shortages and the rapid growth of an unskilled urban, industrial proletariat in the early nineteenth century led to an increasing social unrest that erupted across Europe with the Revolutions of 1848. In the wake of these political upheavals, a concern for the plight of the working classes mixed with an increasing demand for artists to depict scenes of their own time (which had begun in the 1830s) resulted in artists who began to address social concerns in their works. At the Paris Salon of 1850, two Realist works appeared that addressed this new artistic impulse head-on: Gustave Courbet’s The Stonebreakers (1849) and Jean-François Millet’s The Sower (1850). Both of these images depict laborers with an unprecedented sense of monumentality. Painted on a scale customarily reserved for history painting, Courbet and Millet replaced the traditional Classical hero with members of the poor working class. In the wake of the class conflict of the 1848 Revolution in France, many viewers found these images unsettling. Furthermore, in addition to depicting subjects considered unsuitable for large-format paintings, Courbet and Millet also went against the norm by using a palette and painting techniques uncharacteristic of traditional academic painting. Courbet, for example, famously used his palette knife to apply pigment to the canvas, creating a thicker impasto and more matte finish to the surface of his images than the typical flawless, glossy sheen of academic paintings at that time. Courbet’s Stonebreakers is a direct commentary on the poverty that had become pervasive under the July Monarchy in France, which led the people to rise up against their government. Two men—one young and one old—are shown performing the lowest form of manual labor: breaking apart stones to make gravel. Courbet uses a limited color palette to present the scene in a very matter-of-fact way, for which he was criticized (people said that he paid no more attention to the human figures than to the stones). The men are faceless, and their tattered clothes and the paucity of their meal emphasize the starkness of their poverty. It is a scene without hope or salvation, which suggests that the poor’s lot in life is predetermined and unchanging; those who are born poor will die that way, and the young stonebreaker will one day become the old. Like Courbet’s Stonebreakers, the face of Millet’s Sower is indiscernible; suggesting again that it is the work they perform—not their individuality—that matters. However, whereas Courbet offers a more sympathetic image condemning the cyclical nature of poverty, Millet presents his Sower with a sense of respect. The figure strides across the foreground of the image, scattering the seeds for crops as he goes. Millet similarly uses a somber palette for his Sower, which, in conjunction with the scale of the agrarian laborer, imparts a potentially ominous feeling. The image received a mixed critical reception, largely based on the critics’ politics, praising or condemning the work depending on their personal attitude toward social change. Like Courbet’s and Millet’s paintings, the majority of nineteenth-century images that address issues of labor and the conditions of the working classes center around the rural lives of peasants. Artists only rarely depict industrial labor and factories in the fine arts (although numerous images did appear in the popular illustrated press of the time). One notable exception to this, however, is Adolph Menzel’s Iron Rolling Mill, or Modern Cyclops I (1876), which was exhibited in Berlin in 1876 and again in Paris at the Universal Exhibition of 1878. The image pulses with the noise, heat, and energy of the iron rolling mill. Rather than condemning dangerous and exploitative working practices, it appears to be a celebration of industrial ingenuity and growth, as the strong chiaroscuro lends the scene a sense of heroism. This more positive representation of industry is not surprising given the international industrial competitiveness of the late nineteenth century, which was spurred on by the Universal Expositions held across Europe and in the United States beginning with the Great Exhibition (also known as the Crystal Palace Exhibition) in London in 1851. Peasant scenes became increasingly popular during the Second Empire of Napoleon III, which began in 1851, when Louis-Napoleon Bonaparte declared himself emperor of France. But, as they became more widely accepted by the government, they lost the bite of social critique that is so palpable in Courbet’s Stonebreakers. Images of rural laborers became increasingly sentimentalized and nostalgic, as can be seen in Millet’s later work and the oeuvre of Jules Breton. Millet’s Gleaners (1857) continued to draw attention to the difficulty of contemporary peasant life, but in a less confrontational way than The Sower. Three women perform the backbreaking labor of gleaning, or gathering stray wheat left behind from the harvest. The bountiful harvest in the background serves as a powerful juxtaposition to the meager stalks of wheat the women clutch in their hands. Gleaning was a charitable privilege that wealthy famers would extend to their poor laborers, which, though it never included vast quantities of wheat, would help their families through the winter. The bent-over and hunched positions of the gleaners suggest their lowly status, but the figures are more traditional in their poses than the looming figure of The Sower that the public found so unsettling. The subject of gleaning also holds Classical associations to Virgil and Biblical associations to the heroine Ruth who gleaned in the field of Boaz. These literary associations ennoble these poor—rather than contemporary labor politics. With The Gleaners, you can see Millet beginning to back away from controversial, provocative labor images, and in fact the artist actively denied that there was any social criticism in the work when it was first exhibited in 1857. In The Angelus (1859), Millet depicts a much more overtly sentimental scene. The farmer and his wife pause from their work at the sound of the evening angelus bell coming from the village church. They bow their heads while they recite the angel Gabriel’s words to Mary: “Angelus Domini nuntiavit Mariae…” (The angel of the Lord announced to Mary). The setting sun casts a hazy glow across the scene, which adds both emotion/romance and nostalgia to the image. As small farming declined with the rise of industrial farms, idyllic images of a simpler rural past became more and more appealing—especially to the urban-dwelling bourgeoisie. Jules Breton also became well known for his idyllic, sentimental, and unchallenging peasant scenes. Images like his Return of the Gleaners (1859) were more overtly positive than Millet’s. In comparison to Millet’s Gleaners, Breton’s peasant women appear to perform their labor with ease, and effortlessly carry their large bundles and full sacks of grain home. The bounty of their gathering is reminiscent of traditional allegories of the harvest, not the scant remains collected by gleaning. As Breton’s peasant paintings grew in popularity, they became even more sentimental. His Song of the Lark (1884) is an excellent example: a young peasant girl, bathing in the rays of the sunrise, pauses on her way to work to listen to a skylark. This is not the despondent poverty portrayed by Courbet, but a hopeful scene in which a young girl sees beyond her low circumstances to the potential for beauty in the world. Another branch of peasant painting emerged in France in the 1870s and 1880s with the rise of Naturalism. In contrast to the works by Courbet, Millet, and Breton, Naturalists, like Jules Bastien-Lepage and Pascal-Adolphe-Jean Dagnan-Bouveret, tried to remove all sense of emotion from their works—whether it be outrage or sentiment. They sought to create scenes as close to real life as possible, so they avoided referencing past art and infused their images with a specificity of detail that has often been compared to photography. Jules Bastien-Lepage’s The Haymakers (1878) is a good example of the Naturalist style. It depicts two young peasants resting after their noontime meal—the man has fallen asleep beneath his hat, while the young woman appears to have just drowsily sat up. Though not particularly colorful, Bastien-Lepage’s palette is much lighter than Courbet’s or Millet’s, which gives the painting a fresher, unemotional tone. Toward the end of the nineteenth century, after decades of outcry and no visible changes to working conditions, new ideologies emerged in hopes of finding new solutions. Anarchism—or the political ideology that the only way to form a more peaceable society is to dispose of government—became particularly appealing to the Neo-Impressionist artists Paul Signac and Camille Pissarro. Through the ideals of anarchism, they hoped that class differences would dissolve, and thus create a more egalitarian society. Signac and Pissarro both turned to the Neo-Impressionist/Divisionist/Pointillist style of painting, which used individual, equal daubs of colors rather than the traditional strokes of paint. They saw this method as egalitarian each daub of paint is given equal wait and significance as it is applied to the canvas, and thus felt that it best mirrored the Anarchist ideal of a classless society. Paul Signac’s In Times of Harmony (1894) depicts the pastoral Utopia that he thought Anarchism would bring to the modern world (he originally intended to title the work In the Time of Anarchy). The scene is timeless and unspoiled by industry—as are the people, who are not working, but enjoying leisurely pastimes and interacting with one another heedless of differences in class, age, or gender. Illustrates the peace and harmony that comes from peasants working together, each performing his own labor—and the bounty of the harvest that is their reward for doing so. The bright colors of the image reflect the happiness the apple pickers receive from their communal labors. While the majority of nineteenth century images overtly depict rural labor—brutally, nostalgically, or ideally—urban labor is also addressed by a number of artists. These scenes often reflect the rapidly changing nature of urban life at the time. Cities expanded in the nineteenth century, as peasants, unable to survive off the land any longer, moved to urban centers in search of employment. The rise of the middle classes and the ensuing new distribution of wealth in cities also created wage-earners out of populations who previously did not have to work. Richard Redgrave’s The Poor Teacher (1845) is a good example of a new form of labor. This young teacher would have been sent out by her family to work and earn her own way in the world. Sitting alone in the room, she is engulfed by loneliness, with only the letter in her lap (likely from home) and her meager supper to keep her company. Sentimental genre scenes like this were wildly popular with the middle classes in Victorian England. Redgrave’s The Poor Teacher meets these tastes to address concerns of poverty in society, but he is careful to show a genteel form of poverty, not destitute factory laborers who would offend his middle class audience. Ford Madox Brown’s Work (1852), however, is a more straightforward in its social critique. At the center of the scenes, a group of navvies (men who perform hard physical labor, typically for engineering projects) are excavating the road to lay pipes to provide fresh drinking water to the working-class neighborhoods. In addition to depicting the contemporary, changing landscape of London, Work is also a commentary about the contrast between the wealthy and the poor. Various members of either class surround the working navvies, juxtaposing riches and rags—criticizing the idleness of the wealthy compared to the exhaustive labor of the working classes. To underline his message, Brown includes two recognizable figures leaning against the railing on the right-hand side of the scene: the writer Thomas Carlyle and the teacher F. D. Maurice, both of whom were vocal about their concern for Britain’s social situation. Gustave Doré even more bleakly illustrates the divide between rich and poor in his publication London: A Pilgrimage (1872). In this work, Doré juxtaposes the opulence of the world of the wealthy with the destitution of the poor. Images like Over London – By Rail and Orange Court, Drury Lane, outline the dirty, squalid, cramped conditions of London’s working-class neighborhoods. These scenes reflect how the poor were forced to live on top of one another through the unending rows of houses and scores of people filling every open space. Theirs is an unsanitary world devoid of light and nature and defined by brick, smoke, and darkness. By completely filling the images with architecture and people weighed down by layers and layers of threadbare clothing, Doré suggests the unrelenting exhaustion and hopelessness of their situation. Most French artists did not address the bitter poverty of the working classes as matter-of-factly as Doré did. The only other artist to truly be interested in portraying the plight of the urban working classes was Honoré Daumier. Daumier created a number of images portraying the burden of Parisian laundrywomen, who would wash clothes for the bourgeoisie in the Seine, and then carry the wet clothes home with them to dry. It was hard, low-paying, and thankless work. In The Heavy Burden (1850­–53), a laundress, tilted to the side to offset the weight of her load, lugs her basket full of clothes down the Paris street, her daughter clinging to her skirts beside her. Similar to Courbet’s Stonebreakers, Daumier’s Heavy Burden suggests that poverty is inescapable, as the young girl will eventually grow to take her mother’s place. Edgar Degas also deals with the theme of laundering clothing in his series of ironers. However, Degas’ images are not as obviously connected to social politics as Doré’s and Daumier’s. For example, in his Women Ironing (ca. 1884-86), Degas hints at the exhaustion and drudgery that ironing entailed, but that is not necessarily the subject of the work. Like his fellow Impressionists, Degas’ interest was in depicting modern life in a correspondingly modern manner. And, in the nineteenth century, laundering was a burgeoning industry—and one that employed the increasing new population of working-class females. Degas frequently addresses the various forms of urban female labor throughout his oeuvre, depicting not only ironers, but also milliners and members of the ever-expanding entertainment industry of Paris. 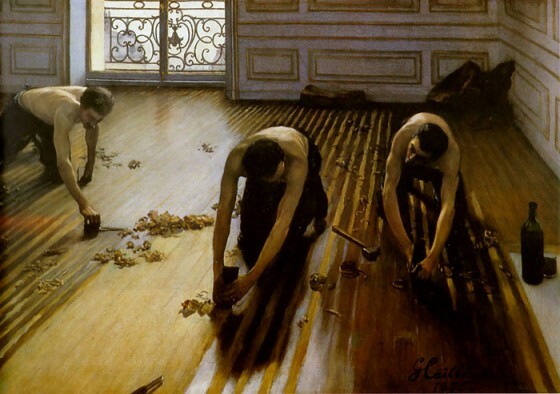 Gustave Caillebotte similarly depicted the urban proletariat in his works, but he typically focuses on working-class males in images like his Floor Scrapers (1875) and The House Painters (1877). Like Degas, Caillebotte’s works depict contemporary male laborers within a modern, cropped composition, a format typically associated with the new medium of photography. Rather than social protest, there is a sense of heroism in these images—particularly The Floor Scrapers—that suggests the value of the honest labor the men perform. Georges Seurat’s Bathers at Asnières (1884) has likewise been read as a depiction of working-class men. The connection to the factories in the background could lead one to infer that these men are industrial laborers. They are not shown at work, however, but at rest—and likely playing hooky from their jobs. So, again, Seurat has taken-up the urban laborer as a theme characteristic of modern life, but his image does not include any evident socio-political undertones. One of the most pervasive—and fluid—forms of labor in late-nineteenth-century art, particularly in France, is that of the female performer. Particularly with Impressionism, and its focus on depicting the new leisure culture of Paris in the 1870s and 80s, women employed by the entertainment industry appear everywhere. One good example is Édouard Manet’s A Bar at the Folies-Bergère (1881-82), which depicts a young barmaid at a popular music hall in Paris. Selling refreshments, she could be read as one of the throngs of salesgirls and shopgirls that filled the shops and department stores that expanded in the second half of the nineteenth century. A new type of employee working inside a new type of establishment, the barmaid is an exemplar of modern Paris. The only hint that we have that she is in fact working, beyond her position behind the bar, is the glazed expression of tedium on her face. The central, display-like position of the barmaid in Manet’s Folies-Bergère and the interchange between her and the male customer seen in the mirror has often led to the more common reading of Manet’s painting: that the barmaid, along with the refreshments she dispenses, is for sale. Women working as salesgirls, barmaids, laundresses, ballerinas, milliners, etc. were paid so little in the nineteenth century that that they were often forced to supplement their income through other means, typically by becoming a wealthy man’s mistress if not an outright prostitute. As class differences began to change and blur in the nineteenth century, respectable bourgeois women in France became more and more constrained by societal expectations of propriety, and the world of the demi-monde (or the class of women who bartered in loose morals to survive) expanded. Interested in depicting the world of modern Paris, “working girls” (or prostitutes) quite often appear in Impressionist and Post-Impressionist works, most blatantly in the oeuvres of Edgar Degas and Henri de Toulouse-Lautrec. However, most nineteenth-century images of women working would have carried connotations of sexual immorality and held a second, unspoken form of “work” for the general viewing public in France. Beyond the representation of various forms of labor in art, questions about the labor of the artist are equally important to a discussion of labor within the discipline of art history. The concept of artists as something more than manual laborers did not exist until the Renaissance. Before that they were considered akin to craftsmen (like carpenters). With the development of the idea of “artistic genius,” we see an increasing emphasis on both the individuality and virtuosity of painters. These two ideas most clearly coalesce in the long tradition of artists’ self-portraits that emerged in the Renaissance. Most often artists use self-portraits as a way of asserting their status and/or their skill. Some of the best examples of this are actually often produced by female artists, like Judith Leyster or Adélaïde Labille-Guiard, who expertly depict the illusion of varying fabrics, techniques, and textures as well as their own likenesses to affirm their ability as artists. In the mid-nineteenth century, Gustave Courbet is another good example of an artist using his own image as a way to assert his artistic skill. Courbet created a large quantity of self-portraits depicting himself in various guises and with differing facial expressions early in his career, like his Self-Portrait (The Desperate Man) (c. 1843-45) and his Self-Portrait (The Wounded Man) (1855). The most famous example, however, would have to be Courbet’s The Painter’s Atelier: A Real Allegory of Seven Years of My Artistic Life (1854-55), in which he places himself at the center of the enormous canvas in front of an easel, painting a landscape. It is a self-indulgent work in which Courbet turns his self-portrait into a large-scale, multi-figure painting (elements that were typically reserved only for history paintings at this time). By surrounding himself with contemporary figures—both real people and popular types—Courbet further uses this painting to announce the new role of artists in the modern world as he saw it: to be of, and to reproduce, his own time. The nineteenth century marks an important moment in artistic production, when rapid industrialization and modernization of the world resulted in new methods of production, new subject matter, new ways of representation, and, toward the end of the century, new ways of selling artwork. Likewise, in this period artists essentially began working in an entirely new way (specifically avant-garde artists, as academic artists largely still retained the traditional ways and means taught by the Academy). One of the most notable instances of artists re-thinking their work practices in the late nineteenth century is in the Arts & Crafts Movement in Britain. The movement sought to counteract the evils of industrial society by turning away from machine production and focusing instead on craftsmanship. It viewed the Middle Ages as an almost golden age for production, when people worked together in workshops or guilds. Because of the Movement’s emphasis on handcrafted labor, it is largely associated with the decorative arts. William Morris is one of the most notable artists associated with the Arts & Crafts Movement. Morris largely worked as a wallpaper and textile designer, and produced his designs, like his Daisy Wallpaper (1864), using pre-industrial techniques. Morris wanted to re-introduce care and craftsmanship to art, ideals that worked in tandem with his socialist political ideologies. He was also an outspoken critic of the exploitive industrial working practices of the nineteenth century, and wrote numerous essays and gave lectures calling for a more egalitarian labor system. Like most members of the Arts & Crafts movement, Morris upheld the medieval workshop as the model method of production. Ironically, however, because of the hand-crafted nature of Morris’s products, they were often more expensive than machine-made goods, and were therefore outside the reach of average working-class people. In addition to issues of hand-craftsmanship, questions about artistic labor in relation to the finish of the painter’s canvas are also important in a discussion of the nineteenth century. According to the traditional method of painting taught by the French Academy (the sole arbiter of artistic taste in France until the late nineteenth century), artists were meant to follow a carefully prescribed system of preparatory sketches and painted studies before moving on to the final work, which was meant to be tightly painted and free of any trace of the artist’s hand. In the second half of the nineteenth century, however, avant-garde artists began to do away with the Academic painting tradition. As previously discussed, Gustave Courbet famously used his palette knife rather than a paintbrush to create a very physically different surface to his canvases. And Édouard Manet was frequently criticized for doing away with modeling in his figures, blending colors together directly on the canvas, and at times—especially in his Olympia (1863)—essentially outlining his figures in black. The Impressionists were then heavily criticized for their broad, unblended brushstrokes. Their works were so far removed from the tightly painted, glossy finish of academic paintings (which has been described as the “licked surface of the canvas”) that to the public eye they looked like mere preparatory sketches, not finished products. People, especially art critics, were appalled that these artists were exhibiting what to their eyes was essentially unfinished work. It is in fact this aversion that gave the Impressionists their name. In his review of the first Impressionist Exhibition in 1874, the art critic Louis Leroy picked-up on the title of Claude Monet’s Impression, Sunrise (1872), and labeled the group of artists the “Impressionists” as a way of mocking the perceived unfinished quality of their works. Somewhat more notoriously, the British art critic John Ruskin severely criticized James Abbott McNeill Whistler’s Nocturne in Black and Gold: The Falling Rocket (1875), writing in his exhibition review that he “never expected to hear a coxcomb ask 200 guineas for flinging a pot of paint in the public’s face.” Essentially, Ruskin was offended by the painting’s lack of detail. In his mind, Whistler did not put any labor or effort into the production of the painting and therefore had no right to ask for such a large sum of money. Whistler responded to Ruskin by suing the art critic for libel in 1878. Significantly, Whistler won the infamous trial by arguing that it is an artist’s conception and aesthetic ability—and not the amount of time or craftsmanship that goes into it—that determines whether a work can be considered art. Thus, the question of artistic labor was literally put on trial in the second half of the nineteenth century with the Whistler-Ruskin debate. By questioning the worth of Whistler’s work based on how much time and effort he put into producing it, Ruskin in some ways could be interpreted as once more placing the artist (or at least Whistler) on the level of the manual laborer who is paid for the time and level of detail—not the concept—of his work. After Whistler won the lawsuit, this assessment of artistic value was firmly refuted, and the ruling upheld the idea that conception trumps labor in art. 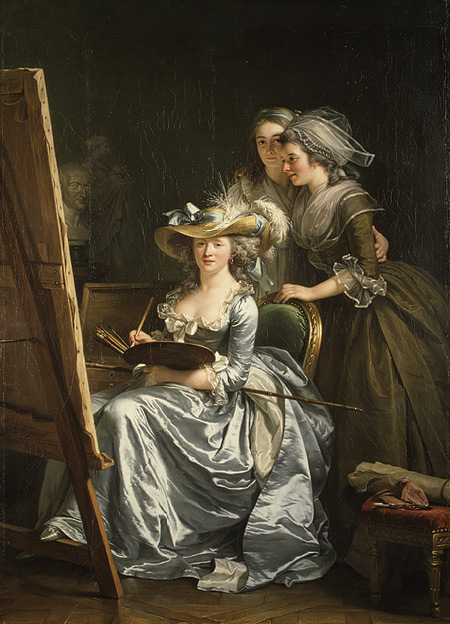 Adélaïde Labille-Guiard, Self-Portrait with Two Pupils, 1785. A fun in-class activity could expand upon the Whistler-Ruskin trial. Have your students debate the merits of each side of the argument. If you are concerned about having students argue both sides, you could divide them into groups and assign them to approach the topic as either Whistler or Ruskin. Give them a few minutes to study the image and formulate a case for their position. Or, bring in copies of the trial transcript as reconstructed by Linda Merrill in A Pot of Paint: Aesthetics on Trial in “Whistler v. Ruskin” (Washington, D.C.: Smithsonian Institution Press, 1992) and re-create the trial. There are a lot of possibilities for a lively, interactive discussion in relation to the Whistler-Ruskin trial and the question of whether the value of artwork is related to the artist’s labor. As discussed in the above lesson plan, the vast majority of images that relate to labor depict peasants. Why do you think that is? If artists are interested in depicting scenes distinctive of their time, and industry is on the rise, why might artists shy away from factories? What is it about agrarian labor compared to industrial labor that makes agrarian labor more appealing to artists? If you did not already do so together at the beginning of class, have your students write a short paper in which they compare one (or more) of the peasant painters to an image discussed earlier in the semester (such as Pieter Breugel the Elder’s The Harvesters (1565)). In what way are these images similar? How are they different? Students should be careful to address both form and content in their response (i.e. what each image depicts, and how they do so). Alice J. Walkiewicz (author) is a Ph.D. Candidate at the CUNY Graduate Center. She has taught at Parsons School of Design since 2011 and the Pratt Institute since 2013. She specializes in nineteenth-century European and American art, and her dissertation explores the intersection of gender, labor, and art in the late nineteenth century.